WHAT DOES THIS MEAN FOR THE AUSSIE CONSUMER? The weakening aussie dollar means tougher times for the average consumer.We have been enjoying the fruits of a high aussie dollar for some time now while our manufacturing sector and exporters have been suffering to the point of near extinction.Ford is closing its manufacturing in Australia in 2016 which in turn effects those companies that supply Ford with its products such as the metals,bolts,machinery etc.This is just one example of many who have suffered in part at the hands of the high Aussie dollar.Many retailers have been forced to consolidate their businesses in order to continue trading as more and more consumers purchased online from retailers overseas.Big names such as ASOS and Topshop have profited from the Australian market which has seen our hard earned money go straight into overseas ecomonies.As a consumer we have had lower petrol prices (although there is debate on this one) and more buying power with our dollar.Well get ready to hop on the rollercoaster as it could be a bumpy ride.No-one can 100% predict if the dollar will continue to fall but rest assured you will see increased prices on petrol,food,clothing and electricals.We ourselves have already been burned by the falling dollar.As stock that has has been order 6-12 months in advance starts landing on our shores, and suppliers request their payments, the price will almost immediately take effect in some industries.Not only will the prices have increased but the cost of freight.Most products imported are paid for in US dollars and the so the rate of exchange will be a double blow.Some in the retail industry are saying the soft demand from consumers and strong competition will result in a slow price increase.I disagree.Retailers have been struggling for a long time on minimal margins in this country and I dont believe they will have enough room in their weak profits to absorb any increases. 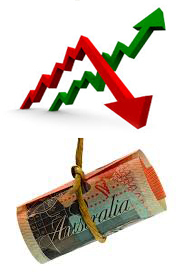 There is an upside to the falling Aussie dollar however.Retailers in Australia will be on a more competitive playing field with online sales to overseas feeling the pinch.Consumers will be even more hesitant to part with their money and so will shop where their dollar goes the furthest.No longer will items purchased from overseas be as cheap as they have been once their currency has been converted.So hopefully this may mean more of our money stays on Australian shores in the hands of Australian businesses rather than supporting other ecomonies. Its not only Australian retailers that will be breathing a sigh of relief, our export industry will welcome the reduced dollar particularly our wine industry.Tourism and manufacturing sectors will also benefit however it may be a little too late for some as mentioned earlier. So all in all while it may be good for the ecomony it will hit the hip pocket of the average Australian.Look out for increased prices on petrol,clothing,whitegoods and electricals and overseas travel.Guess the Australian business world will be waiting with baited breath to see whether it will continue its decline or bounce back like last year.Wish I had a crystal ball...I would be RICH!